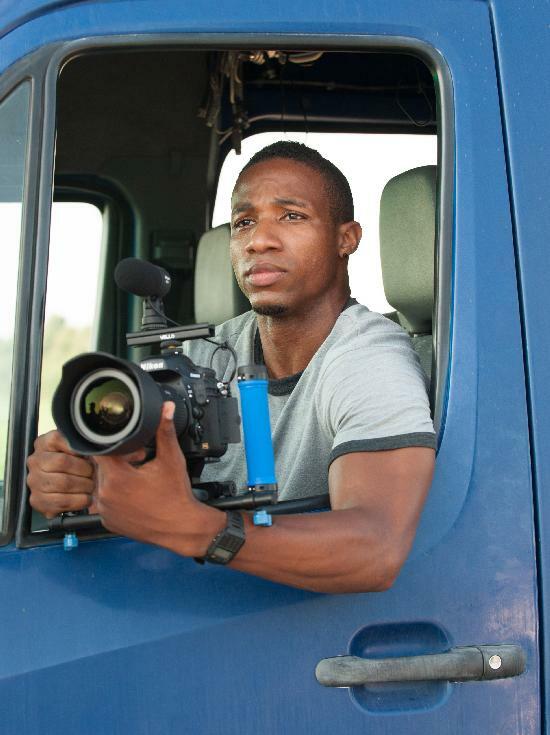 Arlen Escarpeta is a storm chaser in ‘Into the Storm’ from Warner Bros.
Arlen Escarpeta is no overnight success story, having appeared in numerous TV shows and on the big screen. With “Into the Storm” opening this weekend and playing Bobby Brown in the upcoming Lifetime biopic on Whitney Houston directed by Angela Bassett, he is poised to take the industry by storm. “Into the Storm” is by no means like any other film about a deadly tornado. Audiences will be blown away by the special effects and cataclysmic cinematic exploits. At the London Hotel in New York City this week, Escarpeta, cast members Richard Armitage, Sarah Wayne Callies, Jeremy Sumpter, and director Steven Quale had some real life frightening stories to tell The Film Strip. Was it hard to wrap your head around this subject matter? ARLEN ESCARPETA: I’m a fan of weather and natural disasters, but from a different perspective. I’m a huge nerd and anything that I find interesting or unknown or has many layers to it, it grabs me. I love to watch shows like that. When doing research for the film, watching weather channels, some of their documentaries and their stories, I was glued to them. In math one plus one will always equal two. But when it comes to mother nature there’s no rhyme or reason why or how things happens. To me that’s just interesting and like going back to school and learning something new. RICHARD ARMITAGE: I did a lot of the research on the Internet, looking at real footage of this kind of storm elusive as it is because people haven’t quite managed to capture what these people [storm chasers] were trying to capture. What was interesting was hearing the reactions from the people on the footage. So that added a lot of the excitement for me in making the film. So I knew there would be some kind documentation of what was happening in real events even though the film is not based on anything real. The movie just illuminated what is possible. JEREMY SUMPTER: As a kid I grew up watching ‘Twister’ and the weather channel. The weather channel and weathermen were my heroes, sorry dad. Were there any scary moments while filming? RA: It was one take and it was the end of the day and I remember seeing it on playback. It was such a good feeling ‘cause it just looked good. It was sharp and it was in focus. Had we not gotten that, it would’ve had to have been a digital shot. SARAH WAYNE CALLIES: It’s a gift to do those practical effects shots. SQ: —and here, you can play somebody who is just at the mercy of a person who is in charge of this bureaucracy and all that, and trying to work all those details in. You’re not the guy who has the final say, but yet, you have to rise up and try to help these people. I just think that reluctant hero aspect was very intriguing. The everyday, ordinary person. Can you talk about any encounter you had with a terrifying and deadly storm? JS: When I was in 1ST grade a tornado tore through my school when I was in class and we rushed into hallways and had to get down in lockers with hands over our heads, and we heard sirens. So when you see that school scene and heard all the sounds, it’s pretty spot on. RA: I’ve never really been in a storm. I’ve been in an earthquake, which was quite shocking. It’s sort of humbling and leveling when you realize what the earth is capable of doing and shaking you to that degree, yeah. That’s the closest I’ve even been to that extreme. SWC: We did all the comic con press and everybody asks this question and I said no, I’ve never been in a storm. And my husband called me the next day and he said how come you’re not talking about the Tuscaloosa storm that you were in 2011? And the crazy thing is I had completely blocked it out about a week after it happened through filming, through doing press for this movie. A couple of people died in that storm. So I pulled over. The next morning I got back on the highway and right across the highway you could see it was just torn up. Those huge highway signs looked like they were gum wrappers. They were just crumbled up and thrown on the side of the road. It scared me so badly that I completely forgot about it. “Into the Storm,” which is in theaters now, also stars Alycia Debnam-Carey, Max Deacon, Nathan Kress, Lee Whittaker, Kyle Davis, Jon Reep, and Scott Lawrence. Syndicated Entertainment journalist Marie Moore reports on film and TV from her New York City base. Contact her at thefilmstrip@gmail.com. Arlen is a good friend and I’m excited about his success. He’s a good guy and deserves this!